Every now and then I sit through a movie with my daughters and wonder why I just wasted that time in front of the television instead of spending time doing something else. 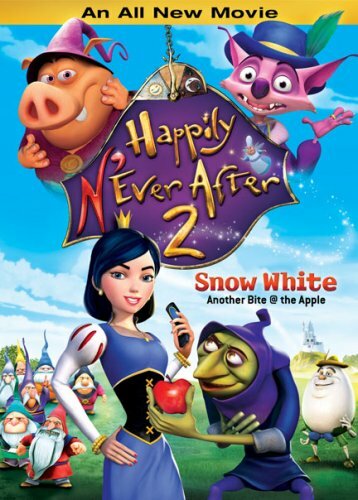 Happily N’ever After 2 – Snow White: Another Bite at the Apple definitely gave me that feeling until about halfway through when it tried to redeem itself. In the era when “making a sequel” seems to be in some cases simply “throwing something out there with a similar title and theme”, Lionsgate seems to have “thrown” Happily N’ever After 2 at the public without providing much reason to actually watch. In Fairy Tale Land, Mambo and Munk assist The Wizard in balancing good and evil. The Wizard watches the action through a cool magic mirror attached to a scale, and when things get out of balance, The Wizard adjusts so that things aren’t out of whack. Somehow, The Wizard seems to have gone on an eternal vacation and left his misfit assistants in charge, which never goes well. Everyone of course knows about Snow White from the Disney version. The Disney classic Snow White and the Seven Dwarfs has a princess, a wicked Queen who believes she should be the most beautiful woman in the land, a group of strange short men who live together in the forest and work in a mine, and a poisoned apple. Happily N’ever After 2 takes it in a bit of a new direction to modernize the tale. Old King Cole and his Queen Caroline do their best to raise their daughter, Princess Snow White, to be a kind and caring girl. But when Queen Caroline passes away while Snow White is just a child, she grows up to be a bit of a rebellious teen. She goes out on the town with her girlfriends, Little Bo Peep, Red Riding Hood, and Goldilocks, and really has distanced herself from the commoners of her land. To try and help his daughter become a better person, King Cole decides to get married to provide her with a new mother. Well, step-mothers have a bad reputation, but Lady Vain takes it a bit too far with Rumpelstiltskin’s help. Using a poison apple that makes Snow White speak vicious gossip, Lady Vain forces her to run away from the kingdom to avoid all those people that she’s hurt with her words. Snow White stumbles upon the Seven Dwarves, who knew Queen Caroline as a kind and helpful person. After hearing about Snow White’s problems in the kingdom, they decide to help Snow White become a better person by showing that people appreciate it if you really try to help them. Together they rebuild the Three Pigs’ houses and babysitting for all of Old Mother Hubbard‘s kids (it is a crowded shoe) and Snow White begins to see the light. But is it in time to save her father from the evil schemes of Lady Vain? Up to the point where Snow White meets the Dwarves, I have to admit I didn’t really enjoy the movie. But as soon as she meets the Dwarves, the movie improved significantly. Is it enough to save the picture? Honestly, I don’t know. My two daughters, ages 4 and 8, enjoyed it. But I think older kids might be quite bored or worse, get the wrong idea about the “lessons” of the film. In addition to the movie, there are three games as special features and a few trailers. Trailers include Happily N’ever After, Bob the Builder, Wolverine and the X-Men and others. The games are of the standard DVD variety: simple arcade, counting, and memory games. In “Snow White and the Great Hall” you use the arrow keys to travel down the Great Hall to smash the Mirror and free Snow White. Along the way, you have to block Rumpelstiltskin’s magic bolts. Rumpelstiltskin got me every time. The “Bo Peep and the Sheep” is a form of memory game. You get to take a look at a picture and remember which of Bo Peep’s sheep has a pink bell. Then Mambo magically makes the bells disappear and you have to remember which sheep changed. And the “Red Riding Hood Challenge,” you get to watch apples fall into Red Riding Hood’s basket, being careful to only count those apples that make it into the basket. When all the apples have fallen, you’re asked to select which number is the correct count. All in all, I was disappointed in Happily N’ever After 2 – Snow White: Another Bite at the Apple. I can only really give it 1 out of 4 stars. Though my kids appreciated it, I wish that it had some of the fun of the first movie and less attitude this time around. If you’re interested, I recommend you check it out at your local video rental store before buying it outright. p.s. If you must pick one of these up, I recommend the first one and not the sequel.